Published in Skin Care, Wellness in the Workplace on August 24th, 2016. Written by Michelle Wilson. Healthy skin is not produced by some magic ingredient combination in a bottle. 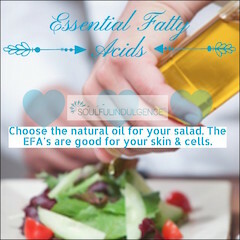 Beautiful, healthy skin comes from within and getting your daily recommended quota of essential fatty acids can help. As we age, our body’s natural ability to re tain moisture within cells diminishes. This loss of water results in skin that appears: loose, dull, irritated, wrinkled, or “saggy” All of these traits are addressable through our diet. Therefore skin will radiate with health as you start consciously consuming the right foods and drinking plenty of water. Because the body does not produce EFA’s on their own, and they are vital for optimal health. We should be consuming these EFA’s to optimize our bodies. To help flush out toxins and keep the epidermis from drying out as evaporation of this essential hydration can contribute to the appearance of aging, cellulite, and acne. 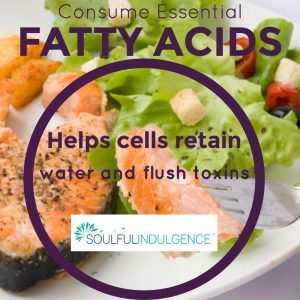 Just bear in mind there is a certain ratio to look up about how to consume essential fatty acids and avoid processed foods, as this will ultimately hinder the EFA’s abilities. These essential fatty acids are probably already getting into your food. Solong as you are consuming nuts, vegetable oils, leafy vegetables, seeds, and grains. You might be surprised to hear that fish may not be the best option anymore. Due to how unstable the waters are with today’s environment. Too much mercury has been showing up in them, but none the less, get a couple of servings in a week. Plant sources are best. Radish seeds sprouted raw, edamame, cooked winter squash, wheat germ cereal, toasted. Try flax seed oil and Chia seeds, both excellent choices.